CheckMark 1095 Software is one of the best solutions in an industry suitable for small and mid-size businesses CheckMark software keeps up to date with ACA requirements to keep our clients compliant. 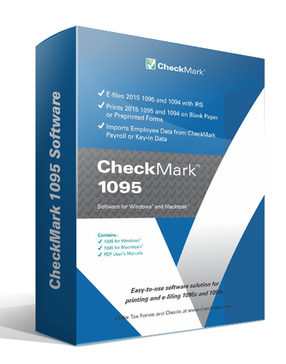 CheckMark 1099 Software Compatible with both windows and MAC platform. Using CheckMark 1095 software users can create unlimited databases, companies and Employees. 1095 Reporting will generate all necessary forms and includes an e-file option in the event your data needs to be e-filed. Protect private information through set up Admin and sub users. Work for CheckMark 1095 Software? Learning about CheckMark 1095 Software? * We monitor all CheckMark 1095 Software reviews to prevent fraudulent reviews and keep review quality high. We do not post reviews by company employees or direct competitors. Validated reviews require the user to submit a screenshot of the product containing their user ID, in order to verify a user is an actual user of the product. Hi there! Are you looking to implement a solution like CheckMark 1095 Software?